Begin by preheating oven to 350ºF. Line 2 regular muffin pans with cupcake liners. Combine flour, granulated sugar, cocoa, baking soda, baking powder, and salt into the bowl of a mixer. Mix on low. Add eggs, buttermilk, 1 1/2 cups warm water, oil, and vanilla. Beat on medium speed until smooth and completely combined. Fill each cupcake liner 2/3 full. Bake until cakes are set and a toothpick inserted into the center of each comes out clean, about 16 minutes. Let cool in pans set on a wire rack for 15 minutes. Turn out cakes onto racks, and let cool completely. 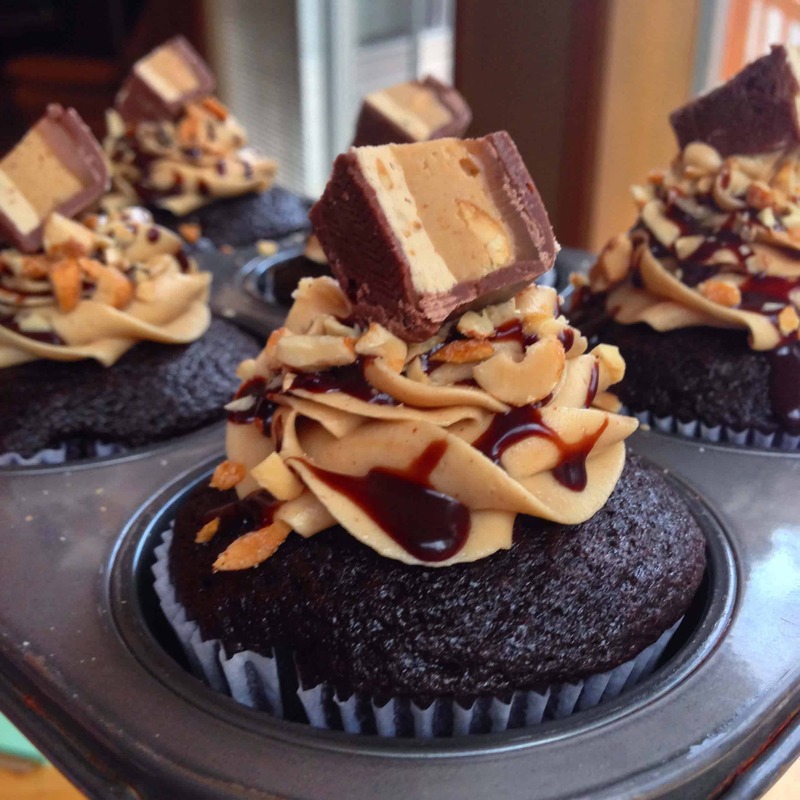 While the cupcakes bake, prepare peanut butter buttercream. Whip the butter and peanut butter in a large bowl with an electric mixer, until it is fluffy. Slowly incorporate the powdered sugar, adding it in multiple installments. As the frosting thickens, add salt, heavy cream, and vanilla. Continue to mix, and add additional cream until desired consistency is reached. Frost the cupcakes with a swirl using a closed star tip. Drizzle cooled ganache over the top of the frosting, and garnish with crushed peanuts, sea salt, and a chopped piece of peanut butter snickers 😀 Next time I make these, I think I’d also try drizzling some salted caramel over the top. Can you use natural coco powder instead of the dutch process coco powder?